Glenn made a transformation in 2010, but he wanted an elite physique. Strict dieting and onslaught training helped him reach 8% body fat! This is a Part 2 of my journey to transform myself from skinny fat to fit. Part 1 of my transformation was featured in September 2010 on the site. At the time of Part 1, I considered myself in the best shape of my life, and I was. However, I wasn't satisfied with stopping there. The challenge for me then was to do even better. With my impending 50th birthday, I toyed with the idea of really getting ripped. 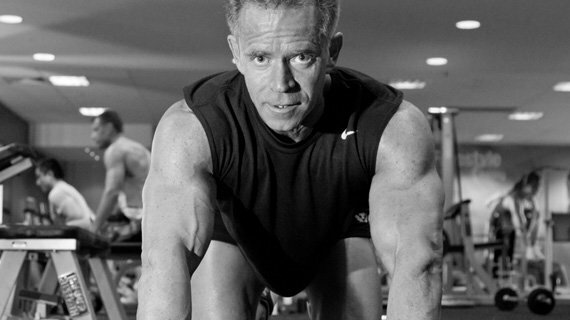 To be "Fit and Fifty" by February 2012 was my new goal, but I had my doubts, at this age could I do it? It was a dream, I really didn't know how to get there. Fast forward 18 months, I'm happy to say I achieved it and even exceeded my expectations. Here is my story of how I did it. I have to begin by saying that before the challenge began I was already in fairly good shape, after 7 years of consistent training. However I'd never been really lean, never seen my abs, and was carrying approx. 18-20% fat all the time. The result was I look fairly bulky; I looked like an off season bodybuilder. 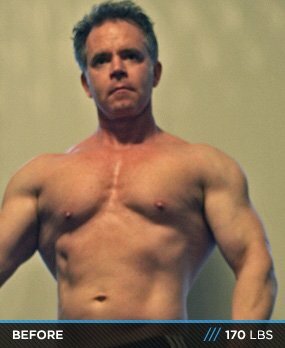 In August 2011 a friend approached me, he was planning to compete in 2012 and suggested I follow his lead and do the same diet and training to see if I could do it too. 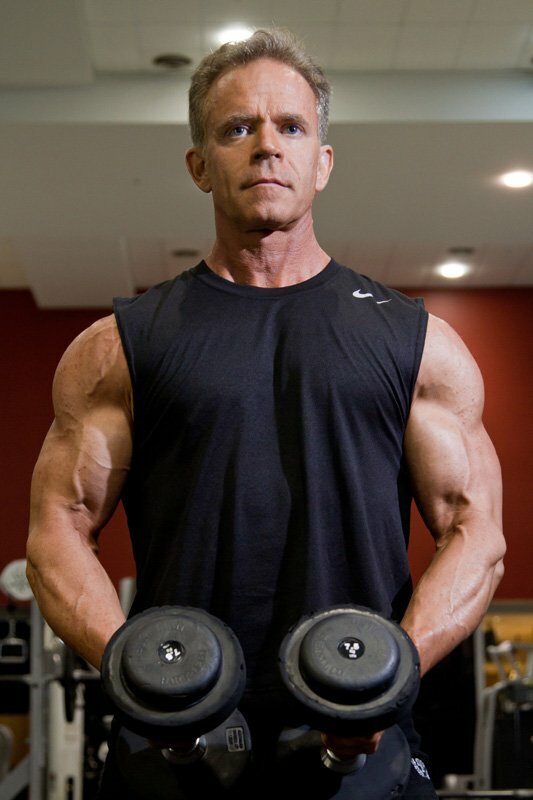 With my 50th birthday approaching I set that as my target date to reach my goal and get a professional photo shoot to document the achievement, and if I did it, the next step would be to compete. In the back of my mind I had my doubts, but I was going to give it everything I had. The challenge as on! I didn't seriously get started until October 10th 2011. This left me exactly 16 weeks to diet and train as if my life depended on it. I started the Journey with a DEXA body composition scan. This was my benchmark, my starting point. I continued to get these every 2 weeks, to ensure I wasn't losing lean mass, but only fat, and to assist with making diet and training adjustments as I progressed. My starting BF% was 19.8%, my objective was to achieve 8% body fat in 16 weeks and maintain my lean muscle mass as much as I could. Glenn - ready to rock. My diet was put together by my friend and trainer, Shane Da Costa, initially starting at 2550 calories per day. One month in it appeared that I needed more carbs to fuel my training and we upped the calories to 2770 per day, and this is what I continued on from week 4 to week 16. The macro split was an even 40:40:20. Once my carbs were raised I was energized to the point that my training was able to be intense. This program required me to train more intensely than normal, 35-40 sets per body part were not unusual and I needed the fuel to make it through without failure. The diet was essentially the same 5 meal a day plan from beginning to end of the 16 weeks. At times we changed the content of the meals, but the calories remained the same. From week 4, the fat dropped from my body fairly consistently at 1kg (2.2lbs) per week, and between weeks 1-8 I was actually increasing lean mass whilst still losing body fat. Apparently I was in the right place diet and training wise and nothing needed to be adjusted along the way. Toward the end of the program I began to lose strength and the LBM did begin to reduce as well, however it was within acceptable levels. My diet plan is outlined below and I stuck to this every day, without variation. In the first 2 months I allowed myself a cheat meal on Sundays but as the deadline drew nearer I restricted these. Christmas Day was the only cheat meal I had in the final 2 months. By week 12, my abs finally made an appearance, I was sitting at 11% BF, at that stage I thought I'd made it, and celebrated the fact with a cheat meal. However, in the final 4 weeks my training intensified even further and those final kilos and BF % melted away.... by week 16, I achieved 8% just in time for my photos featured here. Anyone contemplating this sort of program should be aware that diet is the key to achieving your results; get your diet dialled in and the results will soon follow. Note: Regarding Cheat meals, if you choose to have them, limit them to once a week at most, preferably once a month, the less you have them, the quicker the results. Initially I did them once a week, then once every two weeks, then monthly. This may be the best way to manage the shock to your system as you withdraw the calories and the variety. Any fitness program requires the trainee to not only dial in their diet but to also train appropriately in order to maintain, if not increase lean muscle mass during the program. The body will utilise muscle as a source of fuel when calories are restricted. In order for this to be reduced, the muscles need to be trained sufficiently to signal the body that the lean mass is required and not to break it down or cannibalize. The alternative is to utilize stored fat instead. I have been training consistently 4-5 days per week for 7 years. However this program required me to step it up a notch. Now I use a 6 days per week body part split which had me training everything twice a week. It was gruelling. Each workout consisted between 35 - 42 sets. I varied the workouts so that I didn't always start the workout on the same exercise as before. For example on Day 1: Legs I started with Back Squats and finished with Hamstring Curls and SLDL's. The next week would start with SLDL's and finished with Back Squats, essentially the reverse of the first week. I found this worked my legs better and fatigued the muscles differently from work out to work out. In the end, after 16 weeks of hard training and diet, I more than exceeded my expectations. 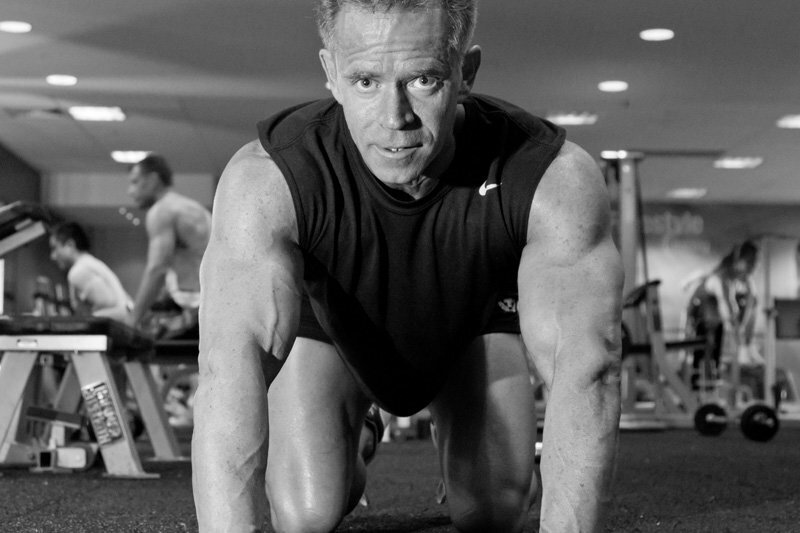 I turned 50 on February 2, 2012 and found myself in the best shape of my life. I felt fantastic. Those around me, strangers and friends alike stopped me to ask what I was doing and how I managed to look like I do at this age. I even inspired a few of my work colleagues to join a gym and start getting healthy. That was reward enough, but I've decided to pay it back, the week after my birthday I began a 12 month accredited training program to gain my Personal Trainers Certification. So my life in the fitness world doesn't stop here, always onward and upward. Next stop, the stage! Monitor your progress carefully - eg: DEXA scan once every two weeks or monthly - this ensures that any mistakes can be caught and corrected before any damage is done. Don't cut your carb intake too low - the result is loss of energy, your training suffers and muscle loss may result. Higher carbs ensure high energy and intense workouts that preserve muscle mass. Keep cheat meals to a minimum but don't underestimate the power of a re-feed, it breaks through fat loss plateaus and also re-energizes you. The same diet consistently over a long period is tough on anyone and we need the mental relief of the odd cheat meal. Make all your daily meals in advance - cook your lunches the night before - it saves time, saves money and keeps the calorie intake within the guidelines. Weigh everything that goes in your mouth. You can't guess, you have to know exactly. I removed red meat, dairy and bread almost completely from my diet. I was a heavy consumer of all these things, which mostly likely contributed to my consistent 20% BF. I have added them back in moderation now. Get ready to feel tired and irritable toward the end of the program. The deprivation and intensity does have a tendency to be mood altering. Warn your friends, or you won't have any at the end of the progam. Make sure you have some plans and other projects to do after the program ends. During the program, it is all consuming and nothing else matters. When it's over, a big void is left in your life, if you don't have plans (e.g. vacation, new job, renovate the house). Depression can set in so make plans post program!